Our beautiful baby girl Aspen came into the world and into our hearts in Canmore, Alberta on March 15, 2016. Aspen brought such joy into our lives, always amazing us with her peaceful way. She was an ‘old soul’ – a perfect baby – so calm and happy all of the time. 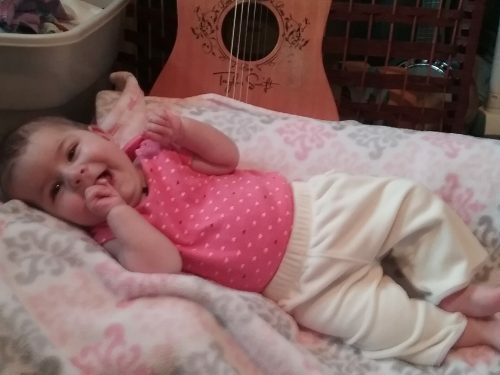 Aspen loved music, spending hours with her mommy singing and going to the local jams. Aspen loved being in nature; her name suited her perfectly. While we were devastated to learn of Aspen’s illness with SMA (Spinal Muscular Atrophy), we are grateful we had the precious time together, creating many memories that will stay with us forever. Aspen will be deeply missed and treasured by her mommy Janice Taylor; her daddy Josh Billingsley; her brother Tanner Billingsley; her grandparents, Susan Ruff, Rodney Taylor, and Barb Billingsley; her aunties Katie and Angel; her uncle Corey; her Nana Sandi; and many other aunts, uncles, cousins, and special friends. Aspen touched people all over the world! The family would like to extend their deepest thanks to Alberta Children’s Hospital and the Rotary Flames House for their amazing care and support, also to Pastor Ray and his wife Chris for their love and guidance, and to the entire musical community in Cochrane who have embraced our Aspen with open arms. A Memorial Service will be held at St. Andrew’s United Church (128 1 St E, Cochrane, AB) on Friday, November 04, 2016 at 2:00 pm. Our local friend musicians are invited to bring their instruments to play some songs during the reception, in honour of Aspen. Memorial donations can be made in Aspen’s name to Families of SMA Canada (http://curesma.ca). Flowers are welcome and appreciated. I am so sorry that Aspen had to leave you. They teach you so much in the short time they are here. But your little angel will always be near you, because she is in your heart. My deepest condolences to you and your family for this tragic loss. May you be comforted by the outpouring of love surrounding you at this difficult time. Aspen may be gone from your sight, but never from our hearts. Jan I am so sorry..My deepest condolences go out to u..for the loss of ur beautiful girl..she may be gone but never ever forgotten..Stay strong my Friend..
Sending you so much love and wishing you peace and offering many virtual hugs across the miles. I have learned so much over the last few months from you yes, but from Aspen as well. Thank so much for sharing such an intimate part of your life so openly Jan.
Condolences to you and your family at this time. I am so sorry to hear of your loss. You don’t know me, but I heard of Aspen through my cousin whose little boy also has SMA. As a new mom, my heart is hurting so much for you. I will pray for you and that the God of all peace may comfort you. Dear Janice, please know that your SNAP family in New Brunswick are thinking of you and sending love, support and deepest sympathy at this time. We will be making a donation today in Aspen’s name. Thank you for sharing Aspen’s life with us. Our thoughts and hearts are with you all today as you celebrate Aspen’s short life…sorry we could not be there to hug you ourselves! Love you lots, Christie, Terry and Stevie Sander.